Crows InterchangeMitchell Grigg off due to an injury. Crows InterchangeDavid Mackay off due to an injury. Kangaroos InterchangeJack Ziebell off due to an injury. Kangaroos InterchangeScott D. Thompson off due to an injury. 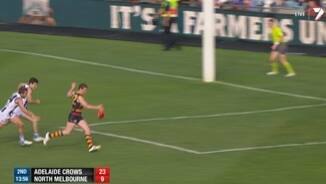 BEHIND CROWSThompson punches it through for another behind to the Crows. 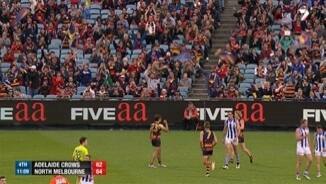 Adelaide continue to chip the ball around with North Melbourne helpless to stop it. BEHIND KANGAROOSGibson hurries the snap at goal under pressure and it bounces through for a behind. North Melbourne are goalless after 18 minutes and they have the use of a handy breeze. North Melbourne have made a terrible start and are not making the most of their use of the ball. Crows InterchangeRory Laird off due to an injury. BEHIND KANGAROOSTarrant marks just outside 50 but his kick is abducted by the breeze and sneaks in for a behind. GOAL CROWSWright holds Johnston by the jumper then asks the umpire what the free kick is for. Johnston works the angle to perfection and kicks the goal. North Melbourne are unable to deal with the forward pressure that is being applied by the Crows. BEHIND CROWSHansen forced to run over the line to rush the behind for the Crows. GOAL CROWSMacMillan coughs it up to Sloane who spots Douglas. He marks and kicks the goal from 40 metres out. Crows off to a flying start. It has been a scrappy start to the match with North Melbourne not allowed to run into space at the moment. GOAL CROWSHenderson runs through the middle and kicks, but it doesn't look good off the boot. As luck would have it Otten marks it and splits the middle with his kick for goal. BEHIND CROWSThompson rushes it through for a behind. We are off and underway at AAMI Stadium. It's redemption time! 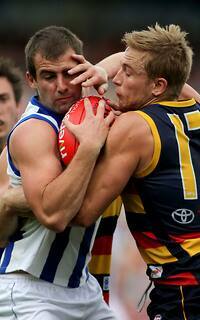 It's Adelaide v North Melbourne with the Kangas seeking to make amends for a one point loss earlier in the season. Welcome to AAMI Stadium which hosts today's battle. The substitutes have been named with Matthew Wright in lime for the Adelaide Crows. North Melbourne's substitute is Taylor Garner who makes his debut for North Melbourne this afternoon. Welcome to AAMI Stadium for the Adelaide Crows v North Melbourne Round 20 clash. 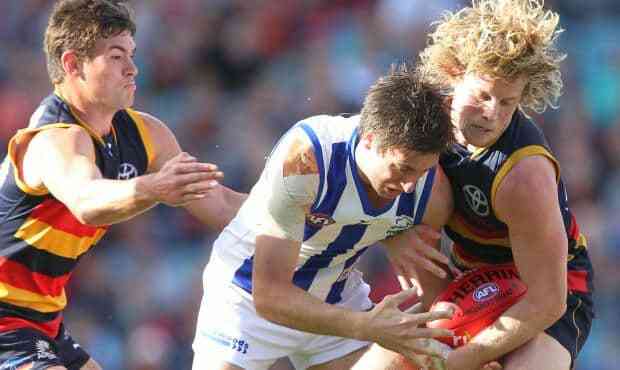 ADELAIDE has survived a fierce North Melbourne fightback at AAMI Stadium on Sunday, securing a nine-point win and all-but snuffing out the Roos' finals hopes. The Crows kicked the first three goals of the game and lead by as much as 32 points in the second term, before Daniel Wells sparked a Kangaroos comeback. Wells amassed 12 disposals, kicked a goal and assisted two more in the third quarter as his side fought back and took the lead. But in a week when coach Brenton Sanderson questioned the players' composure in pressure situations, Adelaide settled and found a way to win. The final score was 11.13 (79) to 10.10 (70). Sanderson said the narrow win was testament to the character of his players. "To be honest, from the coach's box the body language from our boys didn't look great," Sanderson said. "To their credit they dug deep and we saw some boys that didn't want to lose." The result leaves both teams on 32 points, three wins behind eighth-placed Port Adelaide with three matches remaining, making a finals appearance very unlikely. Rory Sloane was magnificent for the Crows, with 28 possessions, 10 marks and two goals. He played a huge role in the last term as Adelaide grimly hung on. Sloane missed last weekend's game with a torn retina, but there was nothing wrong his eyesight when he set Richard Douglas up for Adelaide's second of the afternoon. Lewis Johnston made no mistake form a tight angle but the Crows again wasted opportunities inside 50 and despite eight scoring shots to two, they could only manage a 21-point lead at quarter-time as North was held goalless. Aaron Black nailed North Melbourne's first major and reduced the deficit to 14 points, but goals to Dangerfield, Mitch Grigg and seconds to Douglas and Otten pushed it out to 32. The Crows tried to maintain possession as much as possible late in the quarter; the instruction from the coaches' box obvious after dropping a nail-biter last weekend. 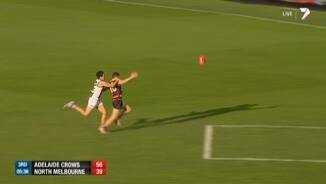 There was barely an effective possession in the opening five minutes of the second half before Kangaroo Leigh Adams snapped truly and Sloane converted from a near impossible angle. Adams kicked his second of the term to reduce the margin to three goals and when Wells benefited from several kind bounces to convert from the centre circle, the Kangaroos were within two kicks. Wells was on top of his game with 12 touches for the term, and set up the next two goals as the visitors took the lead for the first time, 25 minutes into the third quarter. It was a lead short-lived though, as Tom Lynch converted sweetly from 50m minutes before three-quarter time. Ruckman Todd Goldstein's major snatched the lead back for the Kangaroos, only for Jared Petrekno to edge the Crows back in front against the run of play. Crowd favourite Sloane then capped an impressive return from injury with a courageous mark running back with the flight of the ball and converted from close range to effectively seal the deal. 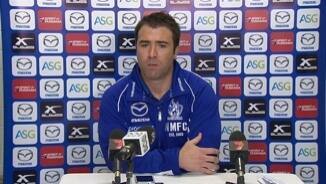 Despite admitting his side had chances to win the game, Kangaroos coach Brad Scott said the better team won. "I want to give credit where credit's due, I thought their pressure was really good," Scott said. 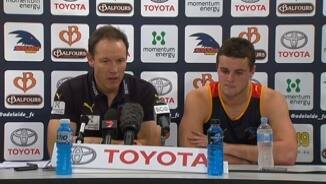 "Clearly we had our chances, got back in front, but I thought Adelaide deserved their victory." Harry Thring is a reporter for AFL Media. Follow him on Twitter: @AFL_Harry.